Provide an overview of the technology used as support in the retail industry. 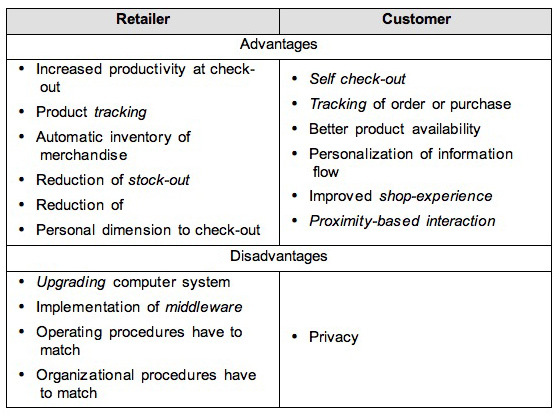 RFID – related innovation in the retail industry. Involves the introduction of new forms of distribution – and therefore new professional roles – and this phenomenon has marked the way the retail sector has developed on a global level, redefining the characteristics of competitiveness. Directly related to production within the commercial sector, therefore involves any component within the supply chain that competes to provide distribution services. New information technology has changed the competitive balance on an intra-sector as well as inter-sector level, leading to new process innovation. Considers any company assets and liabilities that are liquid, or liquidizable within twelve months, part of working capital. Only includes the resources necessary for balanced running of the operation (buying, transformation and selling). better rationalization of use of sales personnel time. render other company functions automatic. 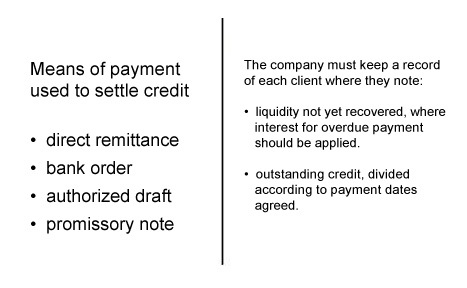 collect disputed credit (unsettled debt). Unlimited loan, generally awarded to public organisations or companies that have a good reputation and financial standing. Electronic technology that allows for constant transfer of data relating to administration and also to commerce and markets. The ready availability of up-to-date marketing information that the retail company obtains from its POS-EDI systems becomes in itself a merchandisable good which can be traded with industry. Manufacturing companies who wish to establish downstream links with operators in the supply chain, can use this kind of information to exploit their productive capacity, maximizing on economies of flexibility. One special receipt that the customer needs to countersign to accept. With RFID tags. By mobile phone with Near Fields Communication. One of the technologies for automatic identification. Allows store to trace individual specific object. Tag (label) or transponder that sends Electronic Product Code (EPC) that identifies the individual specific object. Reader that reads the EPC at a distance. An elaborator that reads and filters the data the reader picks up. “Read only” tags only store information that was inputted when they were created. Tags whose information content can be modified over time, which means that a multiplicity of events that define a product’s history can be associated with it.